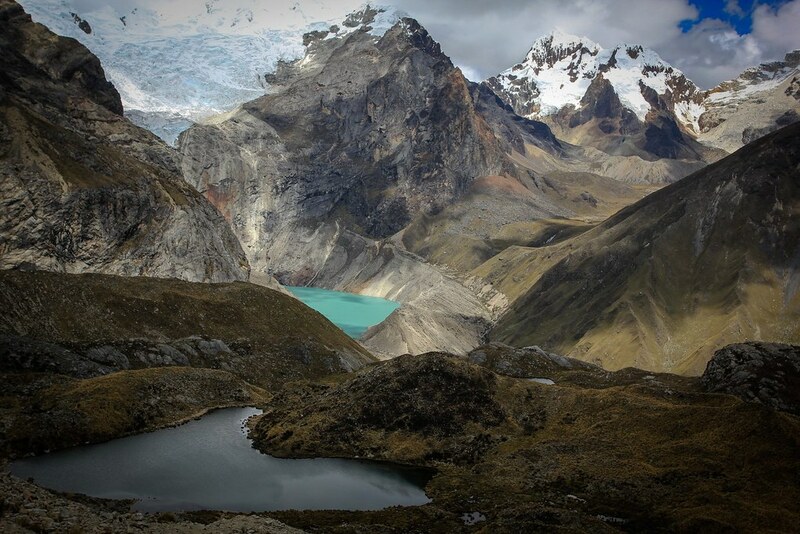 The Cordillera Blanca must provide one of the most varied landscapes for trekking and climbing in the world. There are more than 50 peaks of 5700m of higher, including the highest mountain in Perú Huascarán at 6768m and also the beautiful pyramid of Alpamayo which has been voted the most beautiful mountain the world. There are blue lakes, high passes, glaciers, awesome vertical walls and spectacular campsites. Our trek passes by all these features. Alpine splendisism. Azure Laguna Jancarurish is fed by the massive glaciers of Alpamayo (5947m) and Quitaraju (6036m), both out of sight. Santa Cruz Grande (6241m) appears at the right. Huascaran National Park. Cordillera Blanca. Peru. Day 1: Drive 5 hours to Hualcayan 2900m. On the way we have visits to Yungay where there is a memorial to the thousands of people killed in the 1970 earthquake, and then the colorful local market at Caraz. Day 3: Continue upwards to the spectacular lake Laguna Cullicocha 4850m, then cross the first pass Paso Osoruri 4750m. A long descent to camp at Ruinapampa 3800m. 8 hours. Day 5: Extra night at Cruze Alpamayo Camp to appreciate the stunning views of Alpamayo. Visit Laguna Jancarurish or Alpamayo Base Camp (4500m). Day 6: Climb to the often windy pass Cara Cara 4830m from where we have more fantastic views of Alpamayo and the lakes, then traverse to another pass Mesapata 4500m and before descending to camp at Lake Safuna 4200m 7 hours. Day 10: We enjoy our spectacular mountain surroundings by spending an extra night at Tuctubamba camp. We can take a day hike joining onto the famous Santa Cruz trail and climbing to the pass Punta Union 4750m from where we have grand views of the Santa Cruz Valley, or take a rest day and enjoy the sun at camp. Day 11: At first we walk easily down the Huaripampa Valley passing through farming settlements and villages to Colcabamba. We then climb gently to camp by a stream at Molino Pampa in the Quebrada Keshu 3600m. 6 to 7 hours.